Apple ships a number of very nice desktop pictures and screen savers with OS X—you’ll find them all, of course, in the Desktop & Screen Saver tab of System Preferences. Some of the screen savers, such as Beach and Cosmos, consist of images that appear in sequence, fading and sliding into and out of view. They’re really quite impressive. 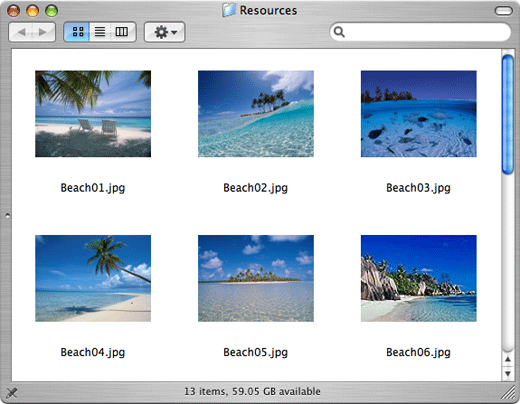 But if you switch over to the Desktop tab of the panel, you won’t see Beach or Cosmos images available to use on your desktop. Thankfully, it’s quite easy to use these screen saver images on your own desktop if you want to. I’ll use the Beach screen saver as an example of what you need to do, but these instructions apply to any of the other folders as well. Control-click on Beach.slideSaver, and pick Show Package Contents from the pop-up menu. When the new window opens, navigate into Contents -> Resources, and voilá , there are the images! From this point, the next steps are simple. Just decide which images you want to borrow (or press Command-A to select them all), and then drag and drop them into the Pictures folder you opened earlier. Repeat this process for each screen saver’s images that you’d like to use. When you’re done, open the Desktop & System Preferences panel again, click on the Desktop tab, and then select your Pictures folder in the source list. Presto!